Itt olvashatsz némi haszons leírást az ArmA3-al kapcsolatban, hogyan tudod optimalizálni a játék minél jobb futtatását, fontos, hogy a lentebb taglaltakat mindenki csak saját felelősségére tegye meg, legfőképp a tuningal kapcsolatban óvunk minden felhasználót. No-one can really tell you the best settings for you as it is up to your computers build and your personal preference, this is meant as a guide only to help you make decisions. Running at the settings recommended however will yield good results both in performance and visuals. 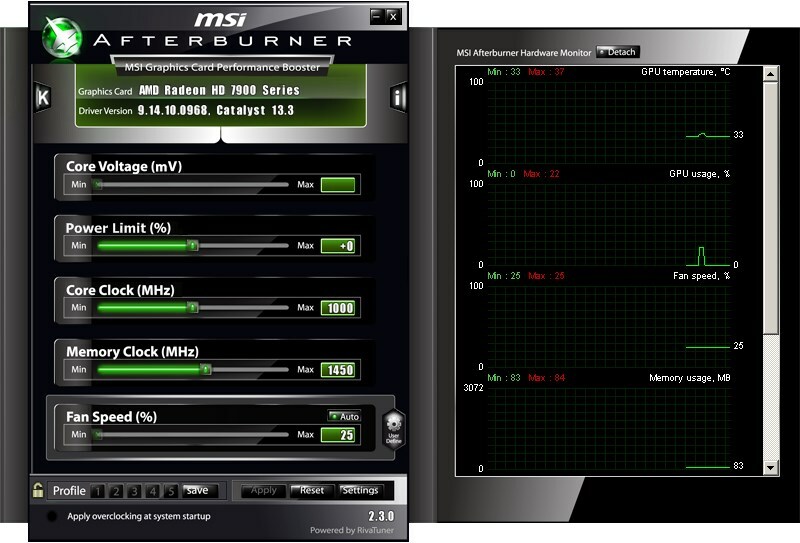 MSI Afterburner (MSI AB) is a good tool to help you tune your settings when you enable the Memory Usage for the On-Screen Display (OSD). MSI AB can also show your FPS to help you discern if a particular setting is giving you a gain or a loss. After changing a setting and waiting a few seconds your FPS OSD will catch up so you can quickly see if you get a gain or loss. 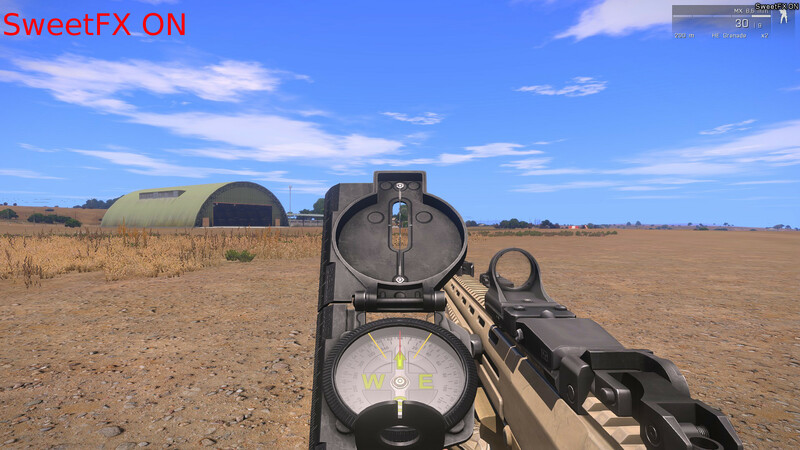 Use ArmA3Mark to fine tune your settings how you like and performance you are happy with. For recording footage I recommend any of these solutions: Fraps Alternative: Dxtory, Fraps Alternative: MSI Afterburner, Fraps KILLER: AVerMedia Live Gamer HD or Fraps KILLER: Nvidia ShadowPlay. Disable CPU Parking, to help steady performance. Use ProcessLasso (or RadeonPro with AMD GPU) to set ArmA 3 to always run on High Priority, and help steady performance. Enabling the 3GB switch on 32-bit Windows XP/Vista may improve performance/stability. Using Razer GameBooster may improve your performance. 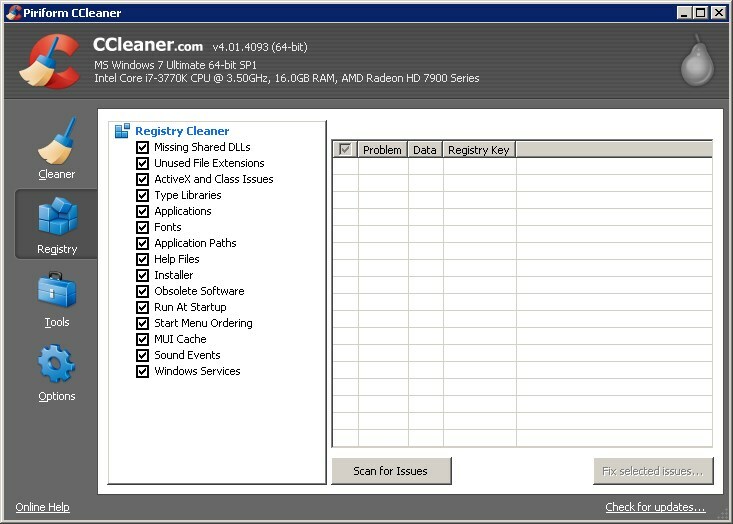 Check out the free PC Maintainance, Security and Utility apps here to keep your PC running tip-top. The TweakGuides Tweaking Companion is all you will ever need to tweak and maintain Windows. Steam gives you the option to install ArmA to a different internal Hard Disk Drive, this helps to improve load times and stability. Update to the latest PhysX driver, not necessary but good habit. Current 21/09/2013. 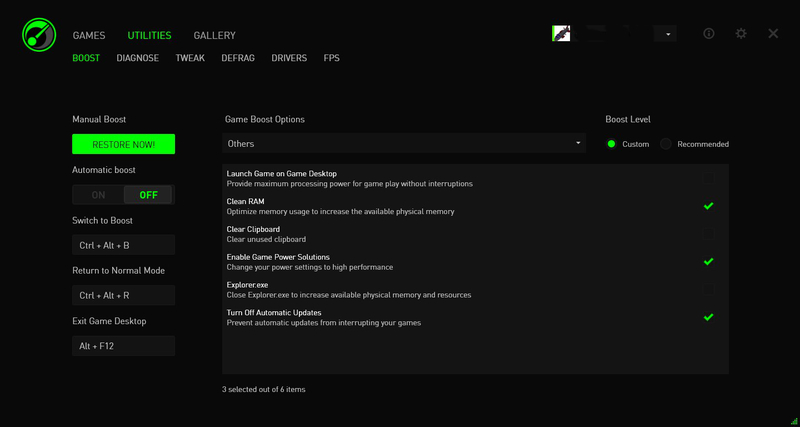 Update to the latest beta drivers for AMD or nVidia to get the best performance. Shadow Quality (GPU): DISABLED or High+, lower settings seem to be worse, Ultra seems to give best performance. Particles Quality (GPU): Standard or High, Ultra seems to have no effect on frames. Cloud Quality (GPU): Low, this setting is superfluous unless you are really into flying. PIP (GPU): Low or DISABLED, while better than it was previously keep in mind that it still consumes a lot of frames while driving for a cosmetic effect. HDR (GPU): Low has better performance. Dynamic Lights (GPU): Low or High, Ultra seems to have no effect on frames. Shadow (GPU): Leave as 100 or off. * nVidia users can test setting Sampling to 200% and Anti-Aliasing to x2 for better performance than AA at x8. ** These settings have the largest effect on your performance. Display Mode: Use Fullscreen window if you are streaming, else Fullscreen is fine. Interface Size: Up to your personal preference. Bloom (GPU): Purely cosmetic, set to whatever you'd like recommended 100. Radial Blur (GPU): motion blur on objects, recommend off or 25. Rotation Blur (GPU): motion blur, recommend off or 12.5. Depth of Field (GPU): is the blur effect you get when trying to look beyond your rifle or other object, recommend off or 25. SSAO (GPU): attempts to approximate the way light radiates in real life, recommend off for performance gain. Caustics (GPU): light rays under certain situations like on the seabed, recommend off for performance gain. AToC (GPU): Set to DISABLED or Trees only, Grass may make your scope lag. Anisotropic Filtering (GPU): High to Ultra, will most likely not impact or increase performance. *** if you disable AA and use just SMAA you should get a similar look but improved performance. GPU_MaxFramesAhead=4; This may help smooth your frames and/or increase performance, try settings 1-4. GPU_DetectedFramesAhead=0; This may help smooth your frames and/or increase performance. refresh=120; This will make VSync work better if you need it. You can also use the startup parameters to increase performance slightly by right-clicking ArmA 3 in Steam > Properties > Set Launch Options and entering the following. -maxMem= set this to 2047 or about 1GB (1024) less than your maximum RAM, I am not sure if higher values have an effect as I'm pretty sure 2GB is the maximum. -maxVram= this option will tell ArmA how much Video RAM your graphics card has, not really important for it to know however. 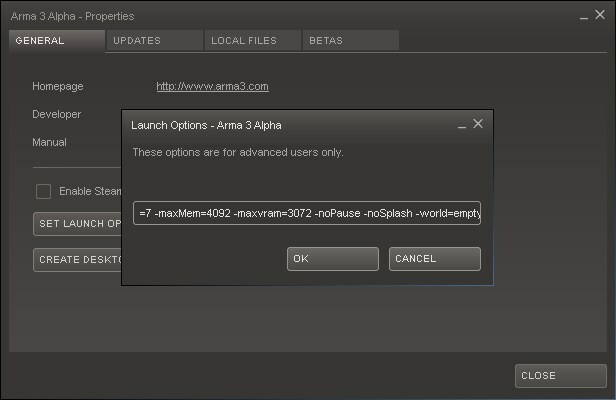 -noBenchmark mainly for the development build this option disables any benchmarking that ArmA automatically does. -noLogs mainly for the development build this option disables any logging that ArmA automatically does. -noPause Does not pause the ArmA window when alt-tabbed in Fullscreen window mode, good for multi-taskers and streamers. -noSplash gets rid of the intro stuff at startup. -world=empty Starts up the game faster as it loads empty level. **** cpuCount and exThreads can help smooth the game by letting it know to spread the load properly. Our very own L2TG found the solution to this fix for nVidia GTX 510/20/30/45/50 Ti/55/60/60 Ti/70/80/90 cards that are experiencing a black screen, while still hearing full sound (and likely full function, without screen), with or without SLI function. Use these ratios courtesy of Stabs. Open <username>.ArmA3Profile in your C:\Users\<username>\Documents\ArmA 3\ folder. The main cause of abnormally low FPS is having VSYNC on, either alt-tabbing out and in of ArmA or turning it off should fix the issue. In ArmA you can actually flush or refresh the VRAM if you are experiencing graphical glitches or sometimes performance issues. To do this you hold down [shift] and [-], release then type in flush. Some AMD users may experience stuttering during gameplay, the fix seems to be disabling Tessellation in either Catalyst Control Center or RadeonPro. Alternatively virus scanning tools may be causing the issue, try disabling them while playing but remember to re-enable them! Additionally it is possible is could be your overclock causing stuttering, specifically the VCore setting, changing to auto may smooth it out while still allowing the overclock. Basically you can use SweetFX to improve the colours of ArmA 3 making it more pleasant to look at, I recommend just using the LumaSharpen and Vibrance (or maybe up to 0.60) values that come already enabled. Both AMD and nVidia users can use the SweetFX Configurator to more easily install and manage SweetFX, however AMD users can use RadeonPro instead to even more easily manage it (this however requires SweetFX 1.4 at the moment). tbbmalloc for ArmA is an experimental custom memory allocator modification that can potentially increase performance. It requires a 64bit OS and at least 8GB of RAM, I gain an extra 5-7 average FPS in ArmA3Mark. Note that you may not see any performance increase in Multiplayer as it is entirely dependent on the server, also this is very experimental and may cause crashes or the like. These spoilers are my personal multiplayer settings as of this edit 21/09/2013. 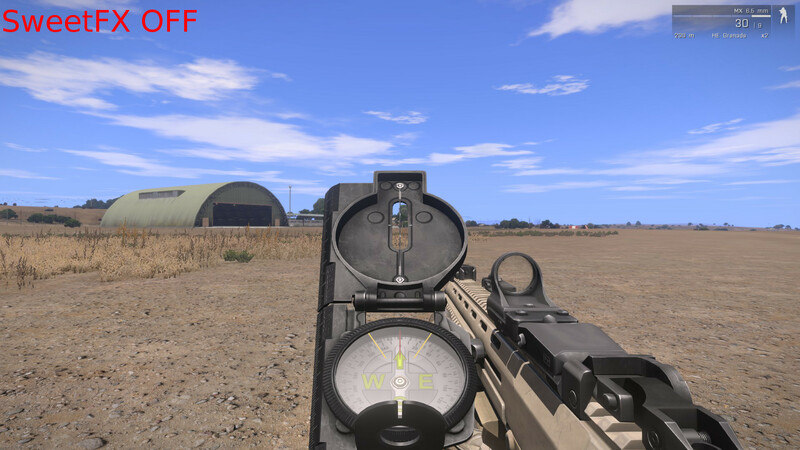 Ran each setting once @ 1920x1080 and 2700 view distance unless otherwise stated, using ArmA3Mark on patch 1.00, with a control sample on the lowest settings possible. When looking at the results if they are close it means there is probably no loss in using the higher setting. Please note that these benchmarks are not scientific as I only ran each setting once, and also because the scenarios can't test every condition. TechSpot also did a benchmark review on various pieces of hardware, take the GPU results with a bit of caution however. In this section I will suggest hardware that I feel is the best fit for ArmA 3, this is as unbiased and as informed as possible based on my experience and the experience of community members.  Again this is solely aimed at ArmA 3 not any other games. CPU: High clock speed Intel CPU's are really the way to go here, either the i5 4670 or i7 4770. You would only get the i7 if you will also be doing multimedia like Adobe or video editing. There is also a 'k' variant for each CPU allowing you to more easily overclock for a little more cash. GPU: The best choice for this slot will be an Nvidia 760+ series, the 2 reasons being ShadowPlay a free screen recorder that performs much better than FRAPS and AMD GPU's having an inflated price right now due to bitcoin miners demand. RAM: 8GB+ of the fastest RAM you can afford from a reputable company like Corsair, G.Skill or Kingston. HDD: Having ArmA 3 on an SSD really helps with load times and texture streaming with the best example being a Samsung 840 EVO. MOBO: Generally said you want a Z87 MoBo for that Intel CPU the best bang for your buck being ASRock, with Gigabyte boards being among the most reliable around, while high end Asus boards have a feature called Sonic Radar which displays visually where audio in the game is coming from. PSU: Any Bronze+ rated PSU with enough wattage for your system from a reputable vendor will do the job with standouts for me being Antec, Corsair and Enermax. AUDIO CARD: If you would like to record teamspeak on a separate track (with Dxtory) you need a sound card capable of stereo mix, an ASUS Xonar DS does the trick for the right price. VIDEO CAPTURE CARD: This is only necessary if you want to record with no in-game frame loss or don't have ShadowPlay, best of the bunch is probably the AVerMedia Live Gamer HD. CPU COOLER: For a CPU cooler I really recommend the Corsair Water Coolers, the H60/80i/100i depending on your needs and budget. CASE FANS: Noctua, Noctua, Noctua, best fans for CFM and quietness, cannot recommend them enough. THIS STEP IS NOT NECESSARY AND CAN RESULT IN DAMAGE TO YOUR HARDWARE, I WILL NOT BE HELD RESPONSIBLE FOR ANY DAMAGE THAT MAY OCCUR AS A RESULT!!! First up I will say that this step is not for the faint of heart, if you do not do this correctly you run the risk of destroying your hardware and I will not be held responsible for that outcome. I also will not link any guides as overclocking is different for every CPU/GPU/Motherboard setup. Overclocking should only be done with a supported CPU/GPU/Motherboard and advanced custom cooling, as you need the temperatures to be within operational norm. Do not overclock if you are in any way uncomfortable! So now that I've established that this is a potentially dangerous step to take, you can see good results from overclocking your CPU, going from 3.9Ghz to 4.3Ghz on my 3770k I saw an 8-10 average FPS increase in ArmA3Mark. Even going from 3.9Ghz to 4.0Ghz will see a notable increase as by default it runs 3.9Ghz on the first core only. Having higher speed RAM also goes helps to increase your FPS, in my quick tests 1600Mhz 7-8-8-24 was 78FPS, 1866Mhz 8-9-9-24 was 81FPS, 2133Mhz 9-11-11-31 was 82FPS with 2400Mhz 10-12-12-31 being 84FPS (do not overclock your RAM, as it can lead to all sorts of trouble, this information is to be used when purchasing RAM). The same results cannot be found however in GPU overclocking, it does absolutely nothing for the benchmark giving back the same results. So CPU overclocking yes, faster RAM kits yes, but GPU overclocking no. Please note that when overclocking it is better to be conservative and stay at the default voltage, this will help make sure your CPU does not have a reduced lifespan. While overclocking make sure to only do so in increments of 100Mhz and to run a prime95 Blend test for 1 hour with HWMonitor in the background to check the temperature, when the test fails or the temperature goes up drastically it is time to stop and dial it back about 2 increments. After that you have to do a 24 hour prime95 Blend to make sure it is stable. Again, do not overclock if you are in any way uncomfortable! Again I cannot stress how important it is to have proper advanced custom cooling on your overclocking supported CPU/GPU, something like the Air Cooler I am running on my rig or a Water Cooler like Corsair's H60/80i/100i will do the job, while on GPU's a Custom Cooler is always recommended over the Reference Cooler. Also performance in Multiplayer is still very much dependent on server performance so results will vary in that environment.